How many times in your career have you witnessed someone say, “that’s impossible – it simply can’t be done.” Perhaps you’ve even been guilty of uttering such a phrase yourself. Here’s the thing – leaders don’t accept impossibility as a valid thesis. If you think I’ve lost my mind, or that my optimistic nature has crossed over into a state of irrational exuberance or delusion, I’d encourage you to read on as I challenge the logic of impossibility. The fact something has yet to be accomplished is rarely evidence of impossibility, rather it usually means whatever “it” is just hasn’t happened yet. Put simply, a lack of a particular outcome signals a lack of accomplishment, not impossibility. History has proven time and again that incurable diseases become curable, so-called laws of science are revealed to have been little more than flawed theory, and physical limitations once believed insurmountable are eventually exceeded. When leaders view everything through a lens of what is they often get a false positive on impossibility. However when they change to a filter of what if the barriers to possibility are often removed. Conventional wisdom will tell you attainment and achievement lead to great outcomes. However true wisdom reveals discovery leads to better outcomes. Great leaders don’t play to an end, they think beyond outcomes – do you? 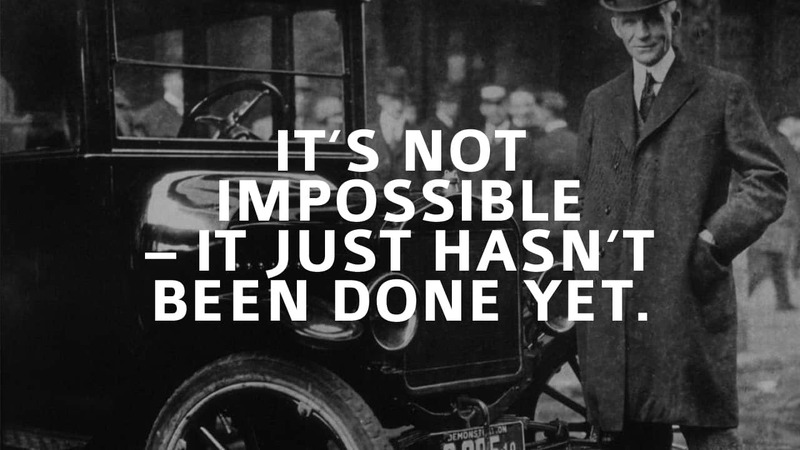 What if Michelangelo, Einstein, Ford, or the Wright Brothers had settled for impossibility over possibility? What if Gates, Jobs and Bezos focused on what was instead of the possibilities of what could be? What if our next generation of researchers, scientists, entrepreneurs, and academics fail to challenge conventional thinking? What if our world leaders continue to view the status quo as acceptable? As a society we cannot afford to embrace theory as fact, fiction as truth, or good enough as good enough. The burden and privilege of leadership simply demands more. When you think about what keeps good leaders up at night, it’s rarely an issue of can things be done, but more likely an issue of should they be done? Given enough time and resources, virtually anything can be accomplished. If you say you don’t have the resources, I will surmise you’re not very resourceful. If you state you don’t have the time, I will conclude you’re not very focused. If you imply you have too many things on your plate, I have no choice but to believe you’re not very disciplined. Where the absence of an outcome or a discovery exists so does a lack of creativity, critical thought, focused energy, effort and resources, and ultimately a lack of leadership. My thesis is a simple one: “The plausibility of impossibility only becomes a probability in the absence of leadership.” Leadership is the difference between what could have been, and what will be. Leaders must refuse to accept the status quo. Consider this – if nobody ever reinvented the wheel, our tires would still be made out of stone. Whenever I see leaders focus on maintenance over innovation, I see people who have unnecessarily drawn the line of impossibility in the sand. As I’ve said before, a leader’s job is to disrupt mediocrity – not embrace it, to challenge the norm – not embolden it, to weed out apathy – not reward it, and to dismantle bureaucracies – not build them. Nothing is impossible until you embrace it as such. Thanks Mark – means a lot coming from you. Hope you are well Sir. Mike – this piece really strikes a chord with me on many levels. 1 – I firmly believe that there is a solution to any problem, and that virtually anything can be accomplished…provided the mind is open to accomplishment. 2 – In basic training, our Drill Sergeants taught us a way of thinking that I refer to as simply, “make it happen.” In times of combat, there is no room for questioning possibility…there is only doing. This same way of thinking serves us well in business. 3 – Success starts (and ends) in the mind. We can accomplish greatness, as well as the seemingly impossible, as long as we believe that we can. While success is never guaranteed, our failure undoubtedly is guaranteed if we do not believe. Thanks for sharing and challenging us to achieve. Thanks Doug – I agree with all three of the points mentioned in your comment. Thanks Arti. Greatly appreciated Sir.